Unit is 83” wide x 57 1/2” deep x 91” tall. Sanitary 304 stainless steel construction with no tube penetrations for easy cleaning. Frame features round tube where possible. Continuous TIG welds on all structure. Product contact welds are polished smooth. All components mounted on welded stand-offs. Unit features stainless steel hardware, conduit, pneumatic lines, and fittings. Electro-polished 304 stainless steel material inlet tube with dust take-off stub. Fill head includes inflatable spout seal for dust-tight connection to bag inlet spout. 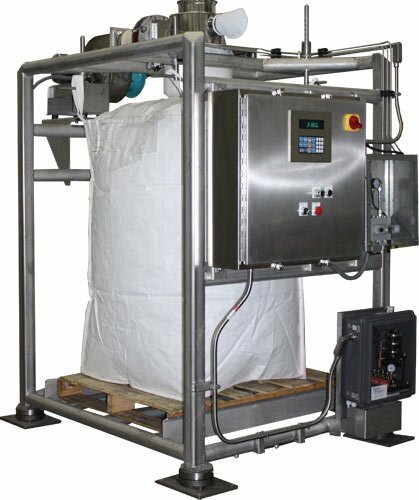 Unit features a 750 cfm electric bag inflation system with actuated butterfly valve. Fixed height frame with adjustable height drive-off bag strap hangers. 304 stainless steel hydrostatic load cells, components mounted in a NEMA 4X enclosure. NEMA 4X stainless steel operator control station with digital weight controller.